Produce your Online Books and learning content for free! NEURONpublisher.com is the easiest way to create a free Online Book or learning content. It’s a powerful publishing platform that grows with you. NEURONpublisher.com lets you create beautiful and powerful Online Books, eLearnings and eBooks. You can publish for yourself or as a publisher under any number of author names or pseudonyms. NEURONpublisher.com is optimized for SEO and getting your site in front of searchers on Google, Bing, Yahoo, and others. Our Happiness Engineers work through live chat (Skype), email, support pages, and forums to answer any questions you have. Our premium plan gives you more disc storage for your files and export functions:PDF, HTML und ePUB. We are looking for authors: expert knowledge, books, scientific papers, training materials,, diploma theses, … . 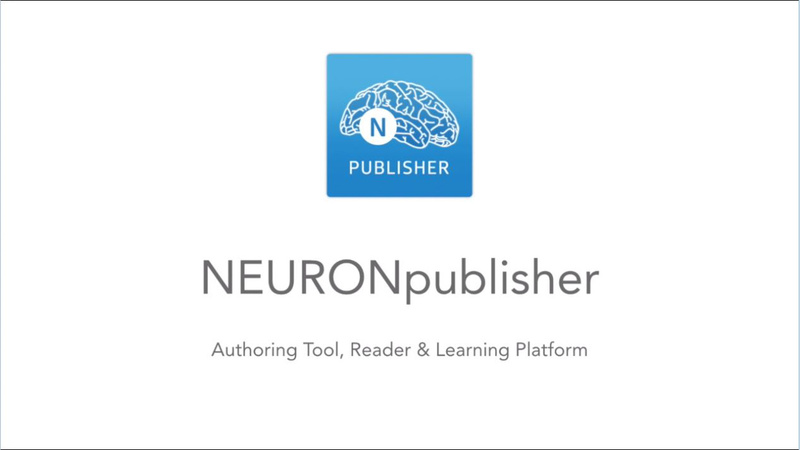 The NEURONpublisher is an authoring tool and a reading & learning platform. The NEURONpublisher allows you to publish everything that resides in your brain.